Human beings are thinking creatures. We think, plan, worry, and fantasise all the time – we can’t help it! We can have thousands of thoughts per day*. Anything that happens to us, or in the world around us, can lead to a thought. Some thoughts are intentional, like when we deliberately try to remember where we left our keys, or decide what we want to eat. Other thoughts are automatic, like when we instinctively make a snap judgement (“That’s ugly”), or when we judge other people (“They’re horrible”), or ourselves (“I’m useless”, “I shouldn’t have done that”). Thinking is what makes humans special: it means that we can plan, imagine, and fantasize. This is tremendously useful and is why we are so capable and ingenious. It means we can make complicated decisions, solve difficult problems, live together in groups, cooperate, and help one another. But thinking comes with costs too: we can also worry, ruminate, and criticise ourselves. Sometimes our thoughts can be overwhelming and we wish we could turn them off. In his book ‘Why zebras don’t get ulcers’ Robert Sapolsky talks about the advantages and disadvantages of being able to think and worry. 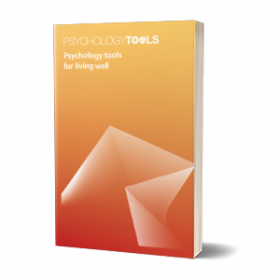 A key idea of CBT is that we can change the way we feel by engaging with our thoughts and overcoming any biases in them. A critical thing to realise is that thoughts are not necessarily facts. Thoughts can sometimes be facts (“That car is red”), but often they are opinions (“He is a nice person”). This matters becasue a lot of thoughts which cause us pain are opinions (e.g. “I’m useless”), and if they are opinions they may not necessarily be correct. Read through the fact or opinion quiz and practice deciding whether a thought is a fact or opinion. Different problems are associated with different biases in our thinking. When we are depressed we are aware of lots of negative thoughts. It can be difficult to remember the good things that have happened to us, so our thoughts are often very pessimistic or hopeless. When we are anxious we are worried about something happening now or the future. Our thoughts may be about threats or dangers. They might be physical threats (to our body) or social threats (to our place in a group or society). Our thinking is not always 100% accurate – sometimes we make mistakes. For example if we are depressed we often predict that doing something won’t be fun – but if we’re cajoled into doing it we might find that we enjoy it after all: this is a ‘predicting the future’ error. Another common mistake is to only pay attention to part of the evidence – for example only paying attention to things that went wrong, and ignoring what went right – this gives us a biased view of the situation. What Can I Do About My Thinking? One of the first steps to changing the way you feel is to be aware of what you are thinking. 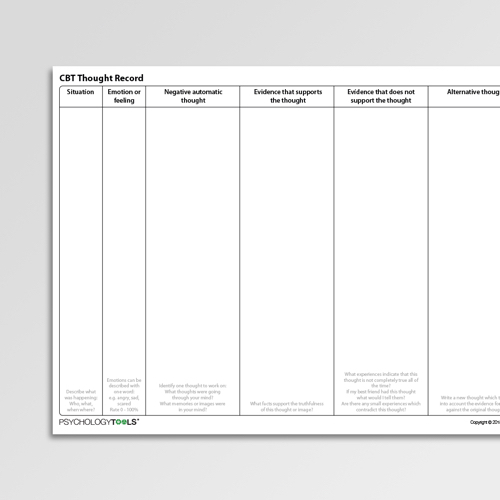 To become more aware of our automatic thoughts CBT therapists use ‘thought records’ as a way of catching them. 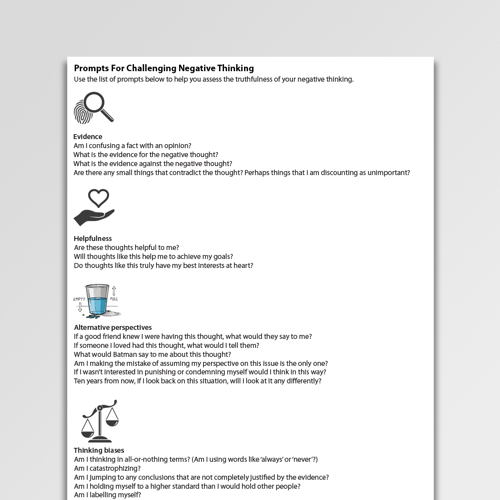 In CBT we are often on the lookout for particular types of thought called Negative Automatic Thoughts. 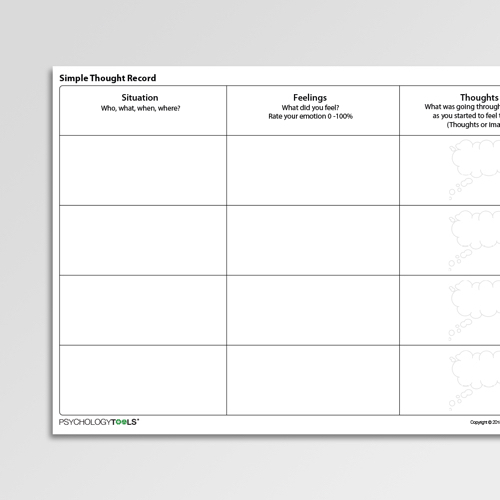 See the Thought Records page for detailed information on how to use different types of thought record. Once you have identified what goes through your mind, and worked out which parts bother you most, it is time to work on changing your thinking. This isn’t easy, and CBT certainly isn’t about ‘thinking nice thoughts’ or ‘looking for the silver lining’. CBT teaches you to think in a balanced way: accepting what is truly negative, but not making the mistake of thinking that is the whole story. Marcy makes a mistake at work. Her Negative Automatic Thoughts were “This is hopeless”, “I never get anything right”, “I’m useless”, “I may as well give up”. With practice she came to see these thoughts for what they were – unhelpful and overly negative opinions of herself. She felt better that day when she was able to see that not everything she had done had been a failure, and that there had even been moments when she had helped a colleague with a difficult problem. 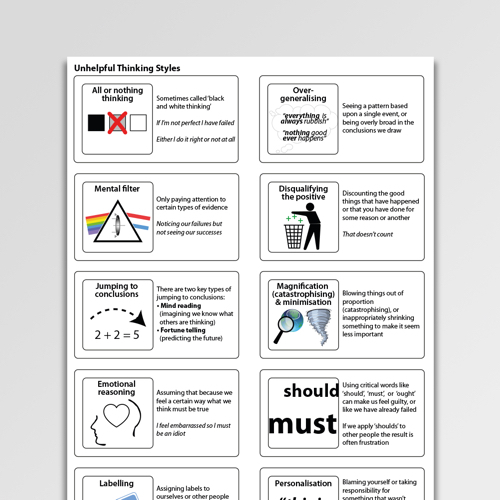 Does my thought match any of the typical unhelpful thinking styles? If a friend told me they were thinking this way, what would I say to them?